A type of sea salt harvested along the coast of Sicily from the waters of the Mediterranean Sea. The water from the sea is brought into the ponds and evaporated by the heat of the sun. Once dried, the salt is removed, crushed and processed into packaged sea salts. 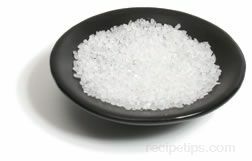 Lower in sodium content than traditional table salts, the Italian sea salts contain minerals which include: iodine, fluorine, magnesium, and potassium. Commonly referred to as Sicilian sea salts, Sale Marino or Trapani sea salts in reference to the regions producing the salt, the Italian sea salts are milled into fine or coarse grained salts with a cubed crystal shape. This variety of sea salt can be used as an ingredient in sauces and condiments or served as a finishing salt for salad greens, meats, poultry, pasta, and fish.